Don't panic - we aren't being invaded - yet. Unfinished objects are cluttering my life and making me feel guilty about all the new projects waiting in the wings, so there's a new rule!! MUST COMPLETE TWO UFO'S BEFORE STARTING ANOTHER PROJECT!!!! MUSTMUSTMUSTMUST!! 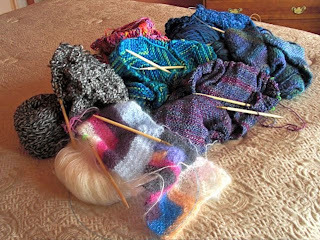 Thank goodness the knitting hobby is light. We have a weight limit on the coach. Ha Ha!! I think you need a cat or dog you can knit sweaters for. Do people have pets when they are RVin? Knitting is a hobby I definitely want to pick up at some point. Yep - people have dogs - but not us! !